In eight days, Mr. H. (otherwise known as Grampy) and I will begin our first in a series of three camps for our grand-kids. R.J., Ben and Charlie came to Camp for the first time in 2004. This is our Ninth Year for the “big” boys! This year, because the incessant rain has pushed the boys’ baseball games well into the middle of summer, the camp for our 11 year olds will be in a hotel near where they live so they can get to their final(?) games for the summer. On a rare sunny day, Ben takes it deep. Grampy and I are up for the challenge….. 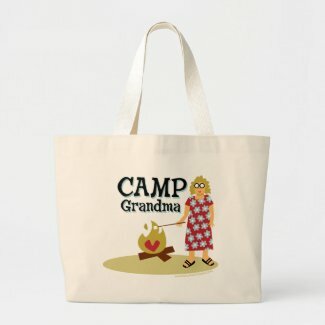 This year, rather than dragging out the screen printer, the talented and creative illustrator, Brenda Ponnay, made some charming designs for Camp Grandma (or in our case, Camp Grandmama and Grampy Campy). Check it out. 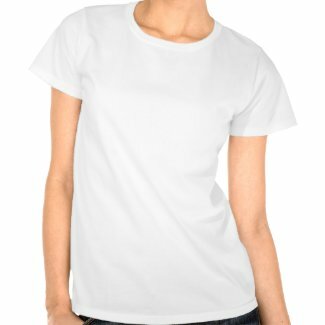 Here I am on a T-shirt!! Yes, I am shaped like a triangle. Check out the sweat pants on Sporty Grandma!! Comfy Grandma keeps peppermints, crayons and loose change in her bag! I picked the “oh boy, you can’t lose them in a crowd” model. 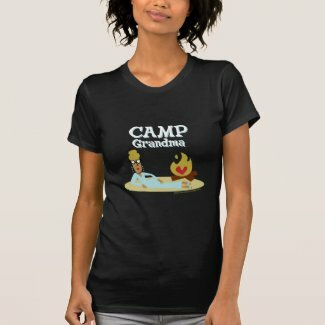 The model of shirt I picked is in deference to our 11 year olds, who just might not want CAMP GRANDMAMA AND GRAMPY CAMPY yelling out from their safety green shirts. Category: Camp, Organizing, Tips and Tricks, What will we do today?